Imagine you and I are standing face-to-face and someone else holds a hand up between us. With the palm towards you, they ask you to describe it. I’d assume you would have an easy time. You’d see all of the intricacies of the hand. The love line, the childhood scars, everything. Now, what if they ask you to describe the back of their hand? With their palm still towards you, it would be impossible. You can assume they have fingernails, knuckles and such. But you wouldn’t see the tiny details. It’s facing me and only I can describe it. And until you were able to see the back of the hand, you’d have no idea what I see. Nor could I tell you what the palm looks like. We are both looking at a hand, yet we both see something completely different. The moral of the story here is that when we have a disagreement with someone, we must realize that we are simply seeing a different angle of the same problem. 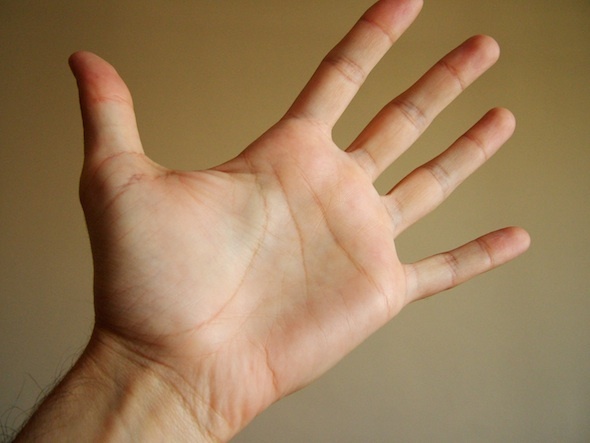 You’re looking at the same hand. How can you see the other side?